Indomitable, robust, and knuckled with the last of bare-fisted fighting, the 1880s was a time brimming of savagery and brilliance. Coca-Cola had coke in it. Sheriff Wyatt Earp was a real guy gunning down outlaws at the O.K. Corral. The Brooklyn Bridge was built, but no one believed it would stand, so a stampede ensued. People died, but the bridge, as we know, has yet to collapse. Oklahoma land was literally claimed by 50,000 settlers in a foot race; toeing up to a starting line with a pistol shot for go, pioneers went Black Friday shopping for American soil. Come with me, and you can, because the American West and East coasts are now bolted together by the First Transcontinental Railroad. With this, the game changed forever, and you might could say, with a heavy dose of confidence and plausibility, the railroad invented the label. Idyllic and rolling hills, groves bursting forth plump fruits, ripening bright in subtropical temps…practically moaning in the romance of it all, you cry “Eden!”. No, it’s actually just an orange farm in California. And, guess what? Your neighbor’s farm looks exactly like this too. And so do the next five farms down the way. And you all have to go to the market on Saturday to sell your citrus. For an added bonus, the whole railroad system has flipped local economics to national; the demand for sweet little clementines now spans across the country. It’s time to get cutthroat. It’s time to stand out. It’s time for a label. Labels and the fruit crate. Fruits were shipped in lightweight wooden crates. Practical, efficient, reasonable. But which crate of oranges was yours again? Mmm. Right. Not sure. Here’s the solution: for the first time, art was employed to market and sell. 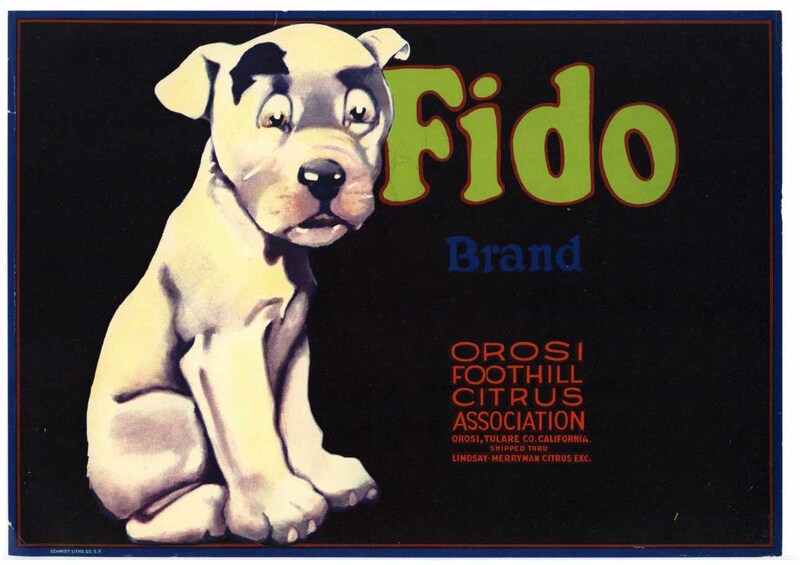 Thick paper labels were glued on the front of the wooden crates to lure the masses into buying best damn citrus around. Consumerism at its finest. 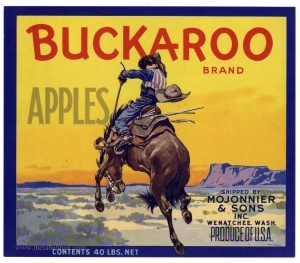 The art for these first labels was watercolor on linen. The artists are mostly uncredited and unknown, but their viewpoint and perspective is not lost with their anonymity. German immigrants from New York and Chicago trade schools traveled West to paint and illustrate for the lithographic print houses of California. This era of Americana is now remembered by how they painted the spirit of opportunity, this larger than life impression of American freedom and possibility. And, hey, if that translates into portraits of fruits the size of your head, round and pink and well-fed pin-up girls, dogs with eyes so expressive your soul rips open on the spot, feathered-crested Native American chiefs, and cowboys on bucking-mad broncos, let it be so. You bought the oranges. 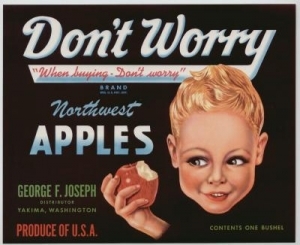 Fruit crate labels from the 1920’s through 1940’s, artists are unknown. If you and I went on a date (we’ll keep it low-key and just go to the drugstore), odds are, I’d buy you a fresh-squeezed orange juice from the soda fountain. 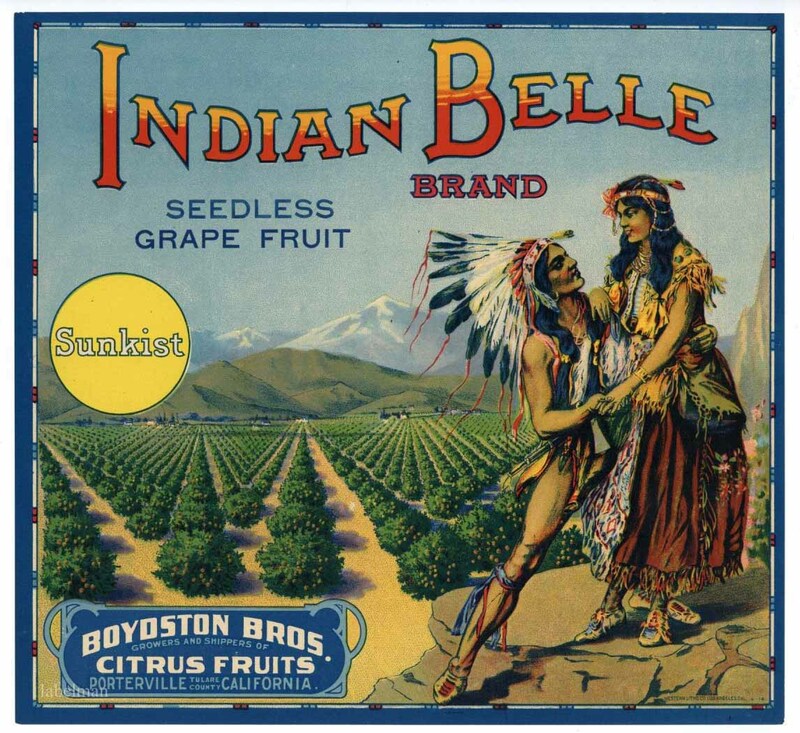 The Sunkist co-op has been a major player since the 1890s, hyping the orange and other citruses to rock stardom. 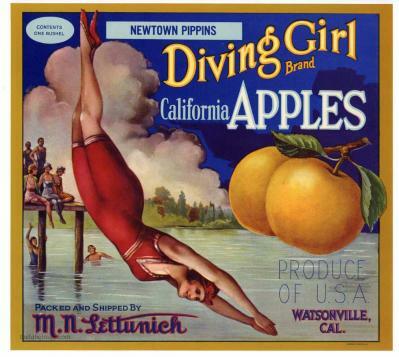 Their marketing doubled orange sales, gave farmers an efficient way to sell their fruits, and handled a blossomy California as she continued to produce in a dramatic oversupplying fashion. Farmers printed labels in bulk for a better price, matching the high demand for fruit. Up until the 1950s, the farmers glued labels onto the front of their crates, it just worked. No second thoughts for seven decades. But as with most stories, one day, you wake up, and it’s all changed, you’re old now, because that’s how it feels looking back. 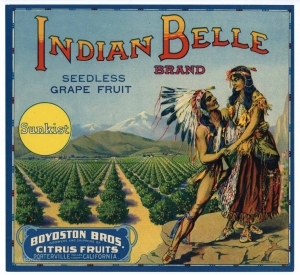 The 1950s, an era of convenience and enterprise, hosted a slow, shimmery, glorious fade into memory for the fruit-crate label: an aging queen, a Blanche Dubois, a painted history. All the while, a young starlet emerges: easy, lightweight, less-expensive, pre-printed and looking very much like a cardboard box. With the apple and pear industry falling first for this corrugated beauty, pre-printed cardboard boxes steal the scene. 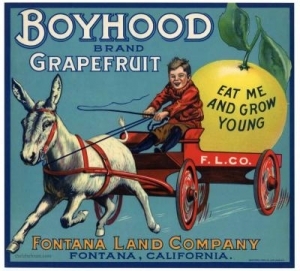 Not long after that, the fruit crate label is rendered quixotic. Where did they go? The labels, you mean? Oh, they are there, right where we left them. The farmers had been printing these little timestamps of American history in excess. It was cheaper in bulk. All across the California hillsides, hidden in the corners of farmhouses were crates of these untouched, mint condition labels. Just forgotten for a time. And we like old things, but what we actually like is the time padded around the old things. This preloved, nonrefundable, used-up construct adds value and mystery, if handled with care. 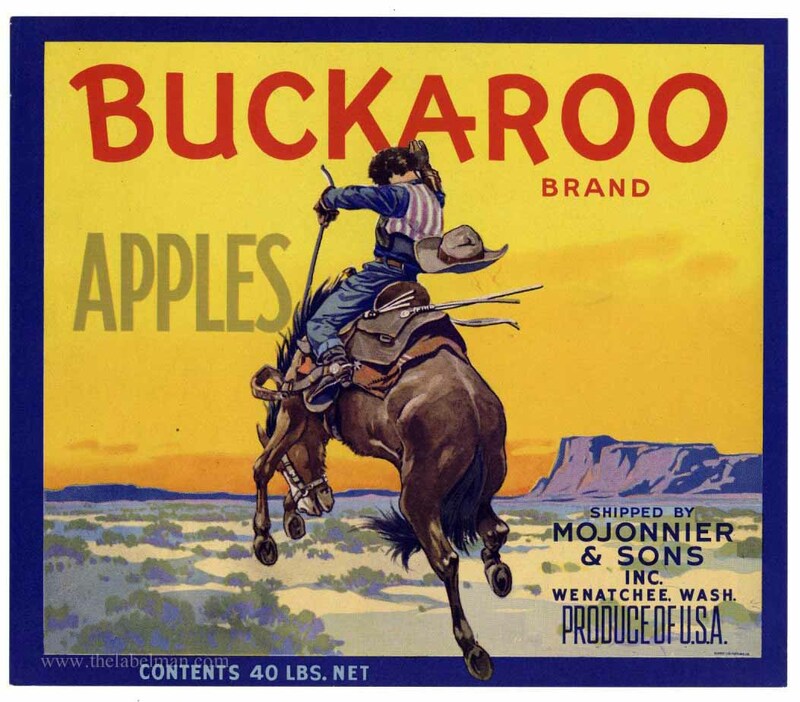 Sometime in the 1960s, literally stumbled upon accidentally, was a crate of these labels in the nook of a barn, and that was the sharp bugle note needed for collectors, connoisseurs, and hunters of the niche to awaken and find more of these original labels. Thick paper fruit crate labels, repping proud the rich delicacies of The Golden State, have stood the test time and can still be collected today. A quick Google search might pique your interest, and a few bucks will get you started. If you look around, today’s labels aren’t a far cry from the first ones. After all, a good idea, is a good idea.